The error message appear as soon as you try to initiate the upgrade by starting the Setup.exe and you don’t really get any information on what causes this. Searching the internet didn’t get me anything regarding this error at all (except one other person having the same error) so I turned to my fellow MVP colleges for some input. As it turned out, a couple of them had seen and worked their way around this issue before (thanks Christian and Steve!). 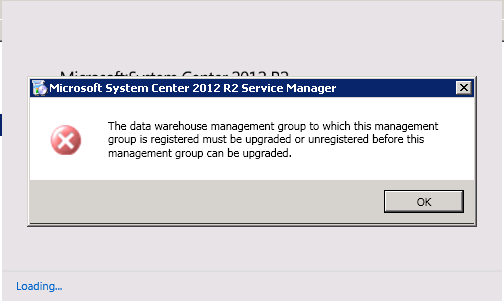 So, to get around this issue you have to Unregister SCSM with the DW, and then do the upgrade. Once the upgrade is completed on both the DW mgmt. server and the SCSM mgmt. server, you can safely register SCSM with the DW again. All data should still be present in the database, but of course you did a backup right before the upgrade – just in case. Right? I don’t know what caused this error, maybe it was the fact that the customer was having a space in their management group name (I have to try that in my lab later on) cause it caused another issue when we tried to unregister SCSM with the DW. Unregistering from DW if you have a space in the management group name is not possible from the console obviously. Instead, we hade to use PowerShell to do this. On the DW mgmt. server, load the SCSM DW PowerShell module and then run the following commands. The command above will retrieve all data sources and display the information needed to run the next command. This command will unregister the datasource from the Data Warehouse. If you run into this error – do you have a space in your management group name? Please drop a comment below! Hello Anders, I have a DW name (DW_NBS Data Warehouse). Thank you for your blog!! It’s getting me closer to the goal. Hello Anders, I unregistered the DataSourceName that had spaces and was able to upgrade to R2, Thank you. However, how do I add or re-register that DataSourceName or Type?